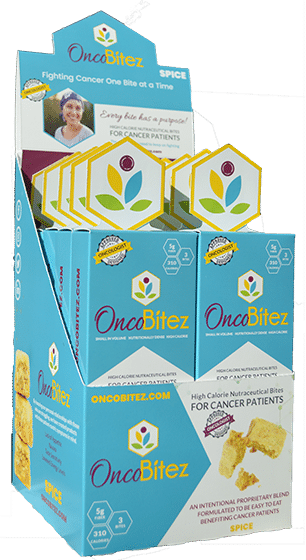 Nutritionally-dense, high-calorie nutraceutical bites that are power-packed with superfoods, beneficial fats, anti-oxidants, vitamins, specialty herbs, and spices. Our introductory flavor, Spice, combine mango, coconut and dates with intentional spices in three easy to eat bites. 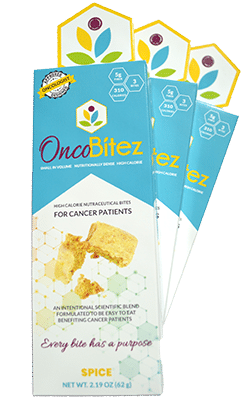 Our OncoBitez is loaded with nutrients, a proprietary blend of spices and natural ingredients designed by an oncologist with the help of an executive chef to nourish the body and to help ease and combat the side effects of chemotherapy that make eating difficult. Developed by an Oncologist, Approved by an Oncologist! 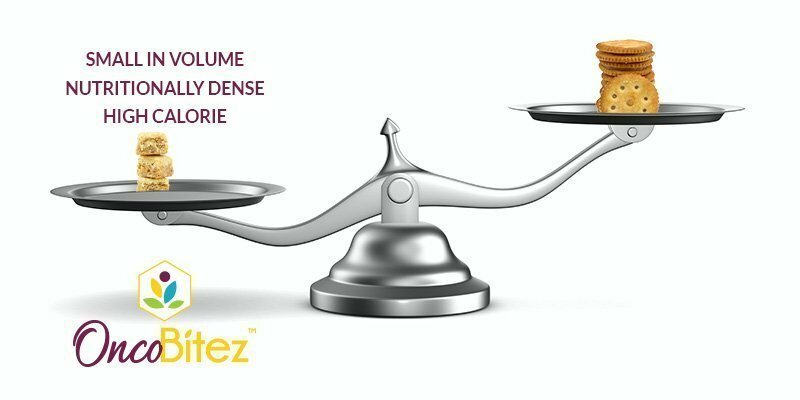 When a patient and his or her doctor are battling cancer, nutrition intake becomes critical. Our bodies need fuel to burn, and nutrition to heal. Up until this point, the options for quick, easy and nutritionally-dense, easily consumed foods has been limited to things like nutritionally depleted convenience foods. When you’re simply looking for fuel, you reach for high-calorie snacks that you hope won’t be offensive in flavor or texture. In the past, when your doctor has told you that you need that quick calorie consumption you would likely resort to the quickly accessible calories like a package of peanut butter crackers. Let’s break down the experience of eating a peanut butter cracker to a typical cancer patient. In the simplest of scenarios, it seems like an obvious choice to eat. All 6 crackers are 200 calories and the boost that the doctor recommends. And, it seems to be a manageable size to consume. However, the actual scenario of eating a peanut butter cracker becomes quickly offensive to many patients. Many treatment protocols create change in their taste buds resulting in salt becoming highly offensive. Beyond just the flavor, the patient likely is experiencing a tenderness or sores inside of their mouth. This symptom also makes the consumption of the dry, brittle cracker a daunting task. With 5 more crackers left in the package- it becomes harder to think about finishing the necessary caloric intake. 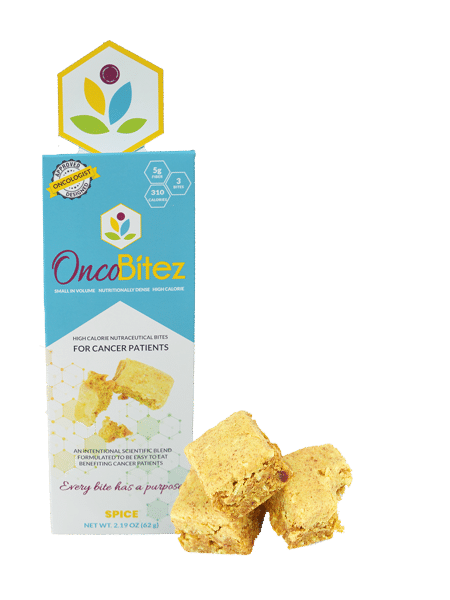 Our bites are designed to combat the negative effects of chemotherapy and cancer as it relates to eating. At Marivation, we strive to use high-quality ingredients that haven’t been tainted by toxins, fruit and plant-based sweeteners, and herbs and spices that have historically been used for their benefits. Our calories are not just empty calories, but packed with flavor, nutrition and benefits that can’t be found in quick convenient snacks. In the scenario of eating a package of peanut butter crackers, you may have obtained the 180 calories, however, you have missed out on the opportunity to have those calories be much more beneficial in both nutrition density and the potential to combat your symptoms. Imagine the effort of consuming calories creating a higher possibility of symptom relief, bringing you the hope that you need to heal. Helping you fight cancer with nutrition. Are you ready to nourish the body?  Our OncoBitez introductory flavor, Spice, is a soft baked moist bite with three bites in a pack. They are packed with healthy fats, nutritious calories and herbs and spices to combat those nasty side effects. Our products are scientifically designed to overcome these cancer-specific challenges that patients face. Not only are we creating high calorie, nutritionally dense products, but we are also addressing flavor and texture concerns that are unique to cancer patients and their symptoms. Marivation will strive to be the most well respected and trusted developer of high-quality nutraceutical products. We will ONLY partner with retail-outlets and manufacturers who operate under the highest of quality standards. Marivation will strive to ensure patients receive the highest level of service. Retail location and overall presentation will be a key consideration when selecting distribution partners.